I was sure it would work well in the crockpot, but it took me several tries to get a result that had the flavor I liked. In the end, I actually found the answer in a cookbook I already owned, Neela Paniz’ The New Indian Slow Cooker. The secret is to use the crockpot to make the sauce separately from the chicken. Then you can cook the chicken, add sauce to it like a simmering sauce, and you’ll also have left-over sauce to make other things. 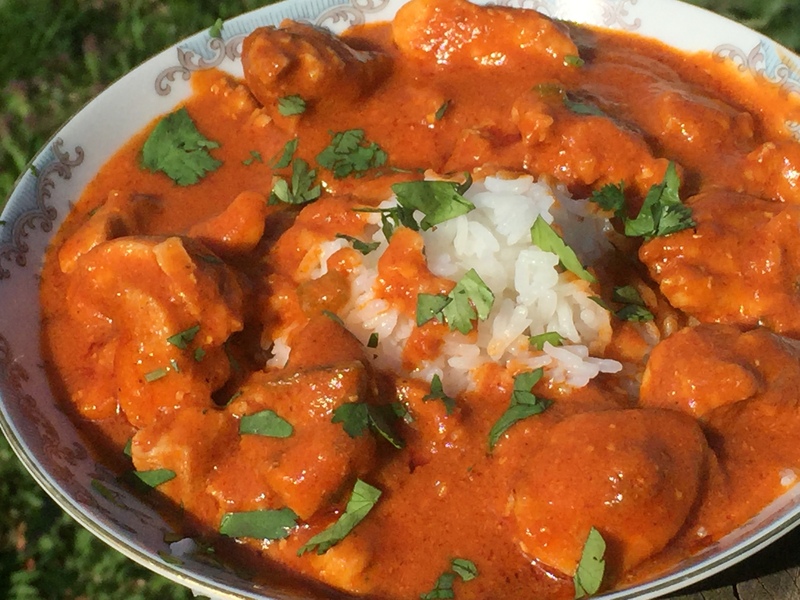 Adapted from "Tomato-Butter Sauce: Makhni" in The New Indian Slow Cooker by Neela Paniz. 14 ea chicken thighs skinned and boned. See note. Cut the butter in pieces, and put in the crock pot, set on high. Let the butter melt. Measure the cream and half and half, and add the safron to begin soaking. While waiting for the butter to melt, skin and bone the chicken thighs, and cut up into bite-sized pieces. 14 thighs should be about right to use all of the sauce, but you can freeze what sauce you don't need (without the chicken! ), so only prepare as much chicken as you intend to eat. Return the chicken to the refrigerator. Add the cream mixture to the crock pot, and mix well. Add the tomato sauce, then use the water to rinse the jars (rinse the firs jar, then pour from one jar to the next to get all the sauce), and add it as well. Stir in the ginger, serrano peppers, garam masala, cumin, cayenne, salt, sugar, and fenugreek. Cover, turn the heat to low, and let cook for the day. When dinner time comes, brown the chicken in a little bit of olive oil. Add sauce to half-cover, and simmer until the chicken is cooked through. Serve with rice and naan, garnished with a bit of chopped cilantro. A ginger-peeling trick I just learned: don't use a vegetable peeler or a paring knife! Use the edge of a spoon. It will peel the ginger easily, and waste less, too. Only prepare as much chicken as you intend to eat. The sauce that you don't eat can be put in jars and frozen, so it's ready to use the next time you want to have chicken tika masala. Or, you could use it on other things. I once made patty pan squash tika masala, and it was outstanding! Instead of simply sauteing the chicken, you could also marinate it in yogurt, then grill it. That would taste even better! In that case, grill it whole, then cut into pieces after cooking it. Do you prefer the texture of the chicken when you cook it separately, vs putting the thighs in the crock pot with the rest? Yes, but more importantly, the sauce comes out smoother and with better flavor. You also have more control over how much sauce you use, since you cook it and use it separately. So if you have giant chickens almost the size of small turkeys like the ones we have in the freezer now, you use a bit more. If you want to make cauliflower tika masala for one, you would use less. Then you can freeze the unused portion. Also, this makes a LOT of sauce, for the same effort as making a little with the chicken in it. I made a huge batch with chicken the other day, and still froze two pints of sauce for later use. That makes sense. I suppose one could use the sauce with leftover roast chicken, for instance.